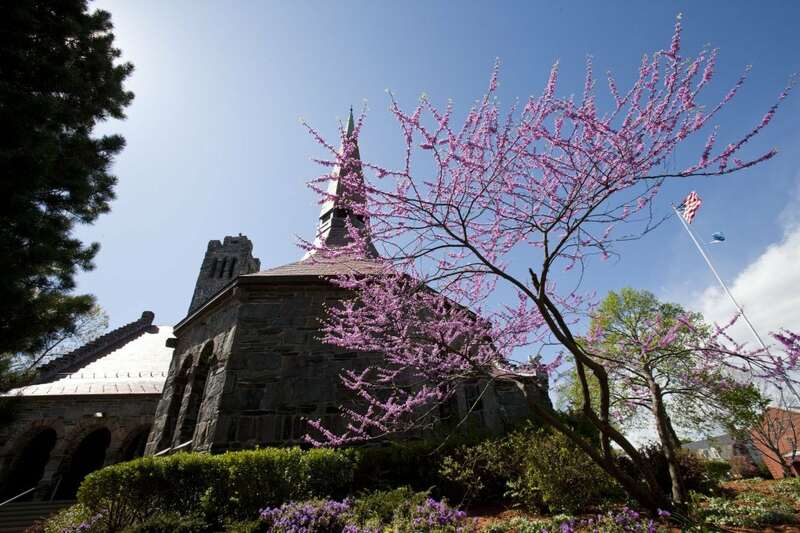 Dedicated in 1883, Goddard Chapel serves as a vibrant center for spiritual and ethical life at the heart of the Tufts University campus. Slight modifications have been made over time to make the fullest use of Goddard Chapel as a center for spiritual, intellectual, and musical convergence at Tufts, and yet careful efforts have been made to preserve (and as needed to restore and enhance) its original appearance and beauty. 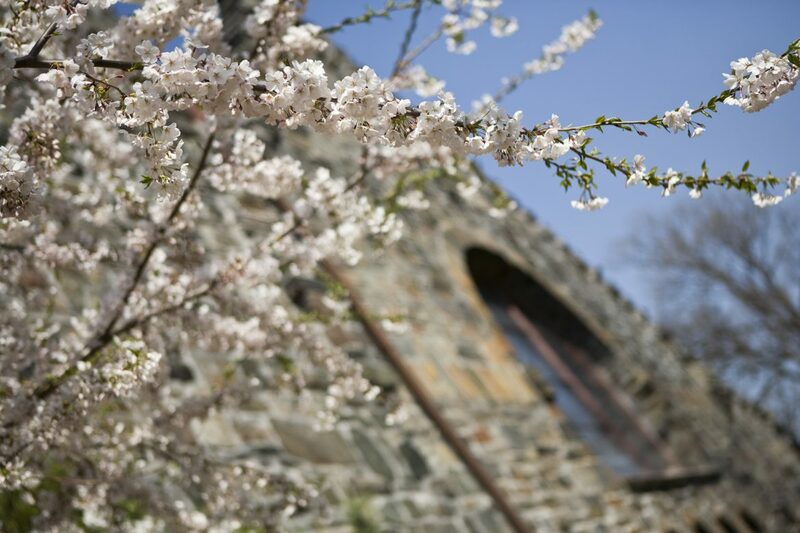 Goddard Chapel is an icon, a treasure, and a gift to the Tufts community and to all who visit here. 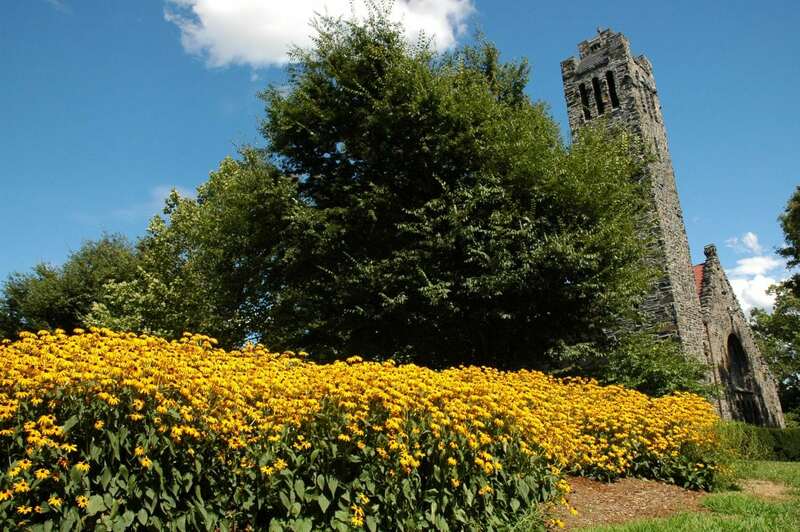 Not only is it a unique example of late 19th century sacred architecture, but it continues to be a place that welcomes any and all into the hospitality and care of this university. 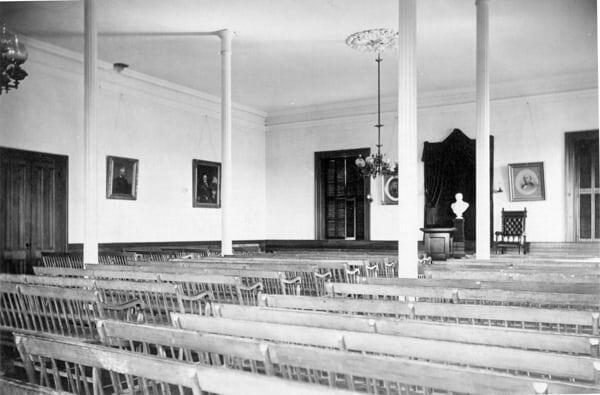 In the earliest days of Tufts College, the Coolidge Room on the second floor of Ballou Hall (the building next door to Goddard where the President's Office now is) was known as the College Chapel. 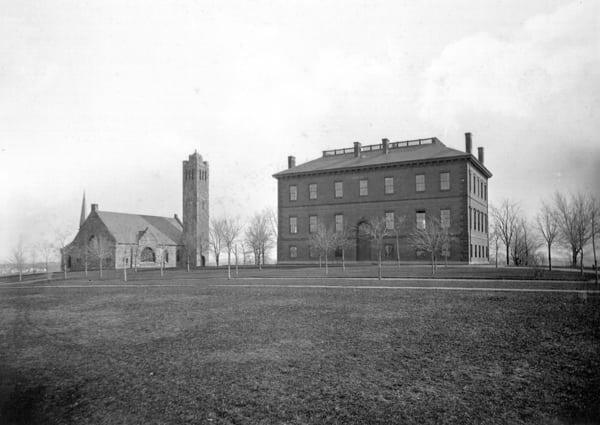 Eventually, however, it proved too small for the needs of the Tufts community. 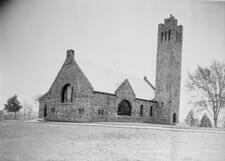 Built during 1882-83 and officially dedicated May 1883, Goddard Chapel was intended as a religious facility that could accommodate the college's entire student body and faculty at one sitting. 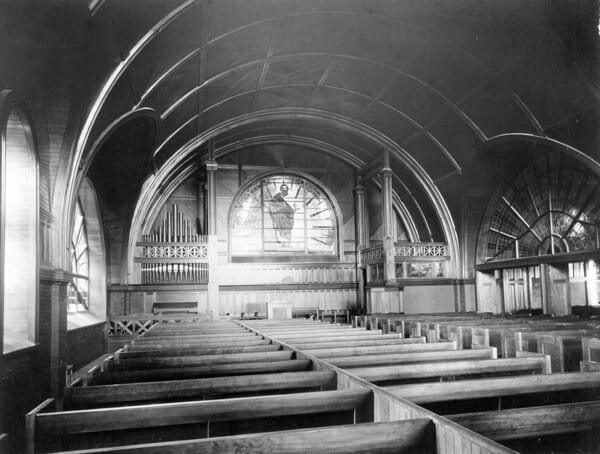 The new chapel was much used: nonsectarian religious services were held daily and student attendance at the services was mandatory. 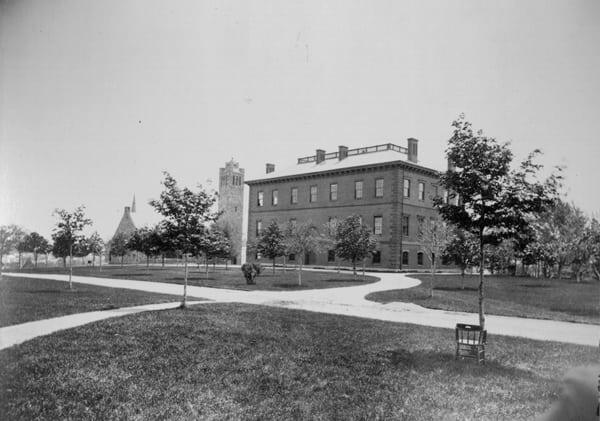 The college's president, who throughout the 19th century was an ordained clergyperson, presided at all services, usually delivering a pulpit address on a moral, ethical, or community issue. Of course, as a building, Goddard Chapel would not have been possible without a series of gifts from the college's early supporters. 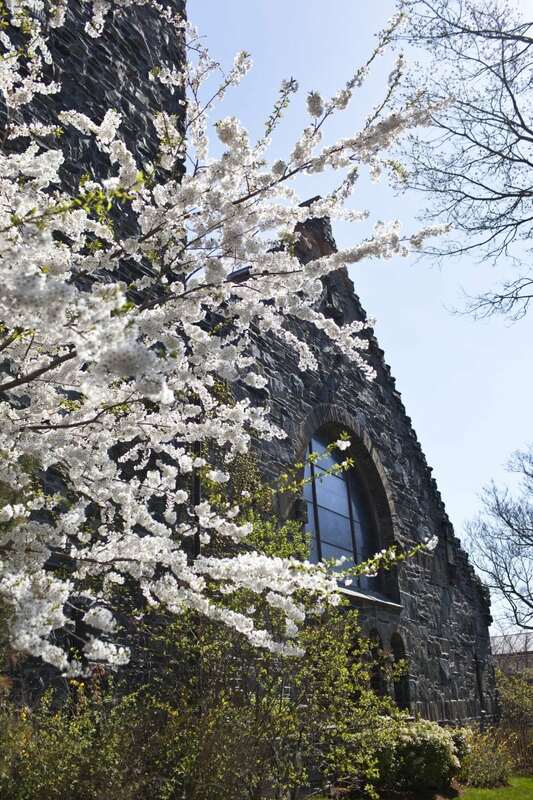 Mary Goddard, also known for her role in the founding of Goddard College (a liberal arts college in Vermont) generously contributed $25,000 towards the chapel's construction in honor of her late husband, Tufts trustee Thomas Goddard. 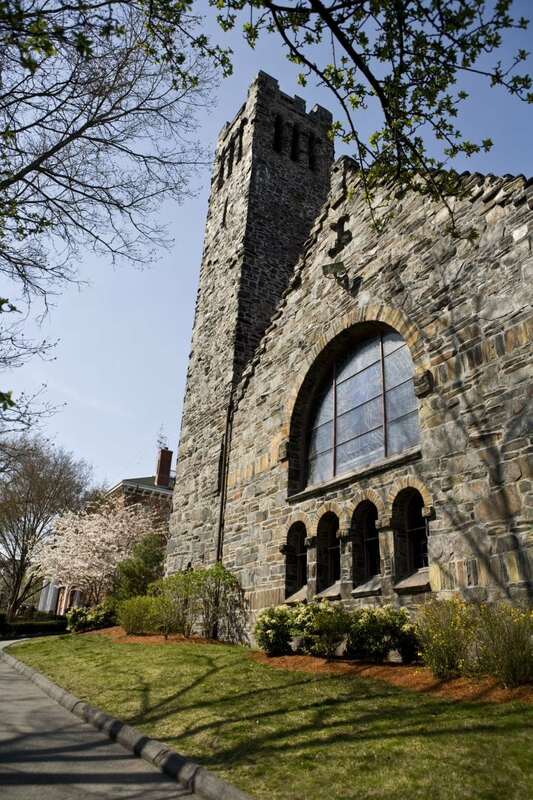 Other donations came from Tufts alumni with the expectation that the chapel would also serve as a memorial chapel. Actual construction costs for Goddard Chapel reached $43,777.33. 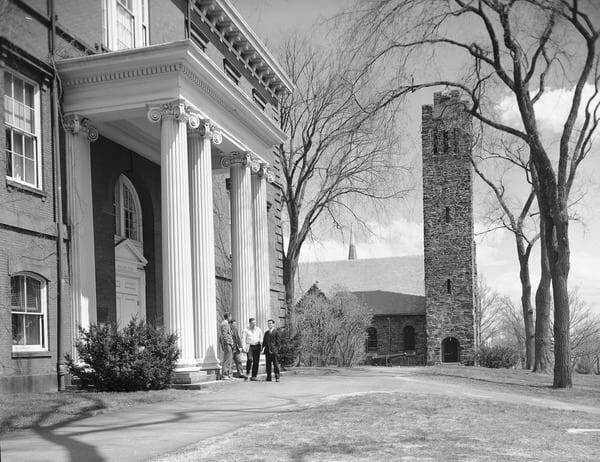 At the time of its dedication, Goddard Chapel was much-admired by Boston-area newspapers and magazines for both its exterior and interior design. 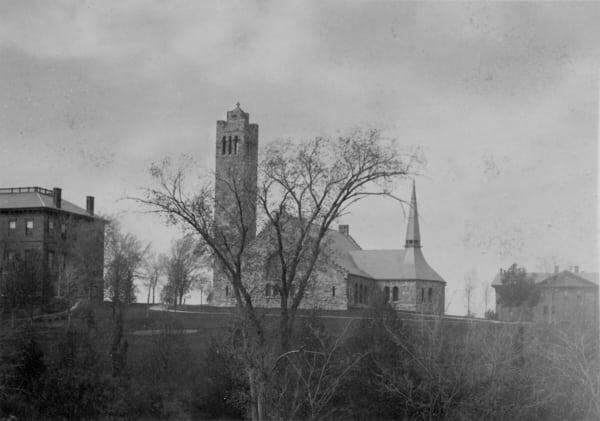 Architect J. Phillip Rinn, who subsequently designed Barnum Hall and a portion of the Metcalf Dormitory at Tufts, chose Lombardic Romanesque style for the chapel. 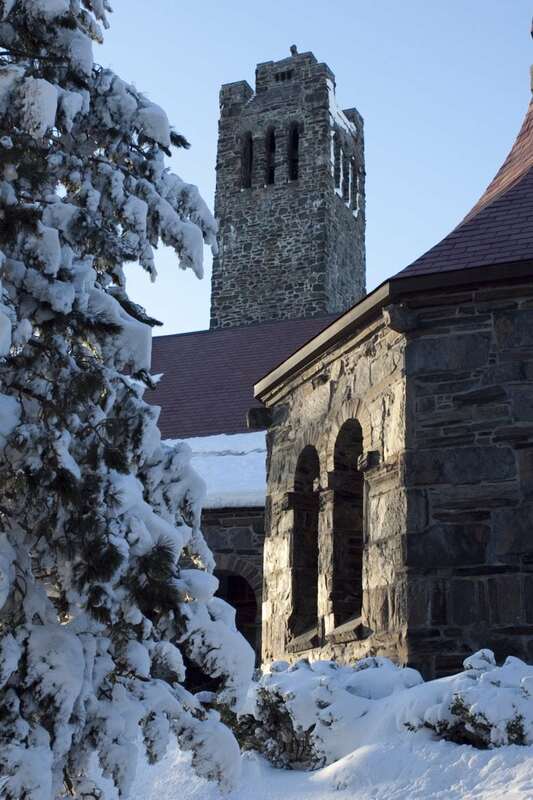 Indeed, both the chapel's hundred foot bell tower and its cloister, a covered porch on the chapel's east side, are distinctly Romanesque features. The exterior stone for the chapel, a blue-gray slate, was quarried locally in Somerville. Rinn's plans for the chapel included ivy to cover or "soften" the austerity of the stone-work. Complimenting the exterior, the interior sanctuary also followed medieval Romanesque motifs. 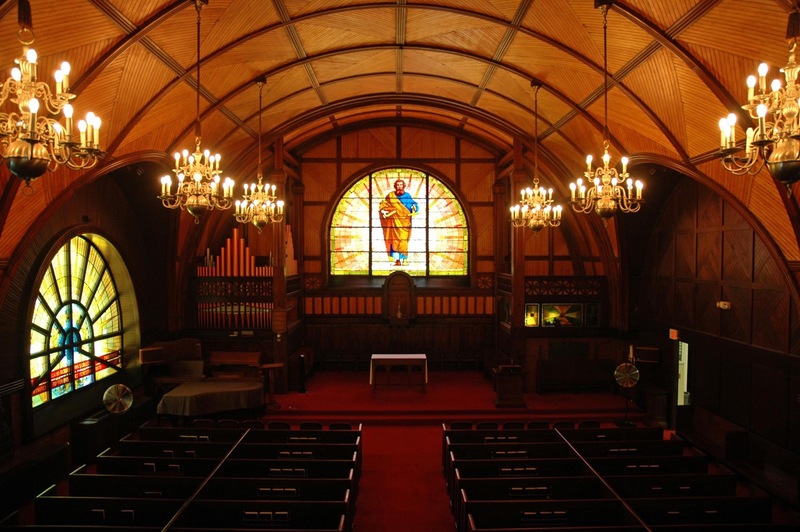 Particularly notable are the ribbed ceiling and the arched woodwork above the stained-glass windows. A variety of woods was used in the construction of the chapel interior. The pews, the pulpits, and ceiling ribs are made of cherry; the floors are made of oak; and the paneling is made of spruce. With only minor exceptions, all of the original woodwork is intact. The prominence of the stained glass windows in the sanctuary was not accidental: Rinn, the chapel's architect, closely collaborated with an Italian-born artist, Tomasso Juglaris, in the creation of five memorial windows, including the largest ones at the front, back and west side of the chapel. Rinn was not only responsible for the thematic content and design of the windows, but also for the innovative acid process by which color was actually etched into, rather than painted onto, the glass. 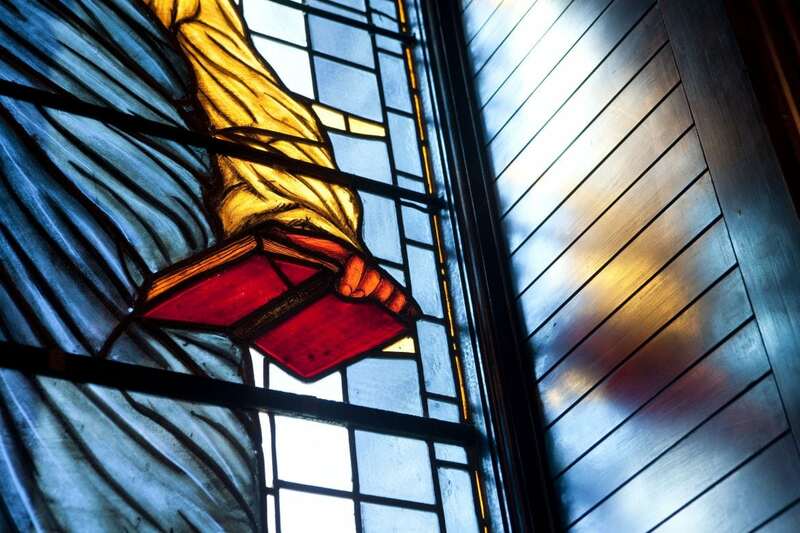 The value of the stained glass windows in Goddard Chapel is as much historical as aesthetic: the stained glass of the chapel sanctuary represents at least two stages in the renewal of this "lost art" for Europe and America. During the Protestant Reformation of the 16th and 17th centuries, stained glass, as well as other church adornments, fell into disfavor. 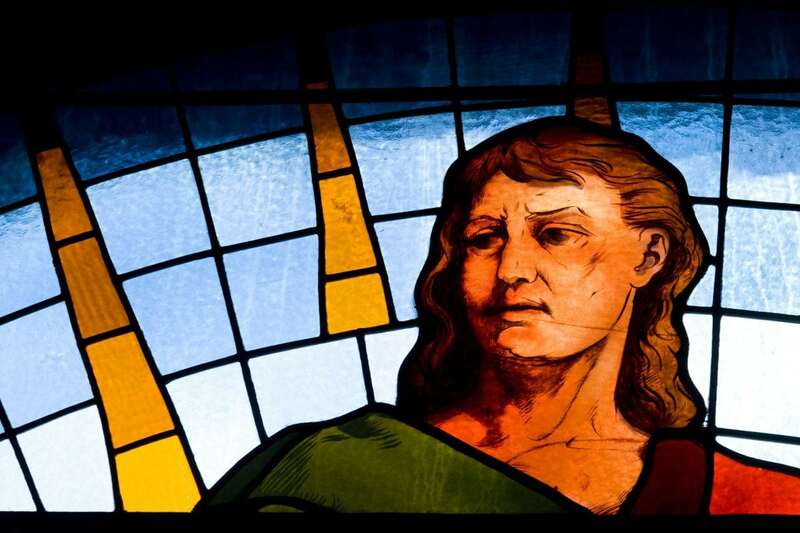 It was not until the mid-19th century that an interest in stained glass was revived. Unfortunately, there were few, if any, craftspeople who new how to replicate the masterful stained glass work done centuries before. In the end it was 19th-century science that saved the day. 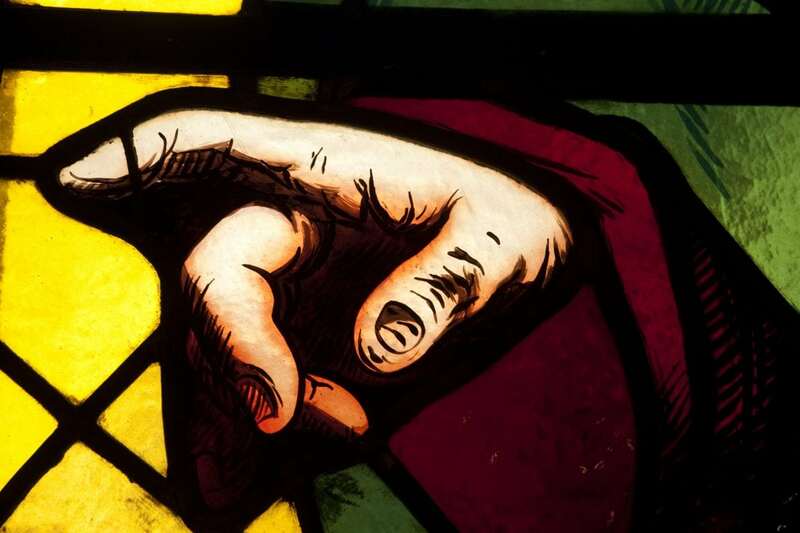 It was put to work to rediscover old but forgotten secrets regarding stained glass production. Stained glass was first introduced to the United States after 1860. 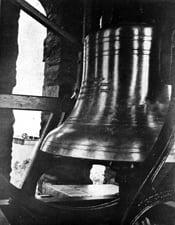 A high state of the art was achieved by American craftspeople only during the 1890s. 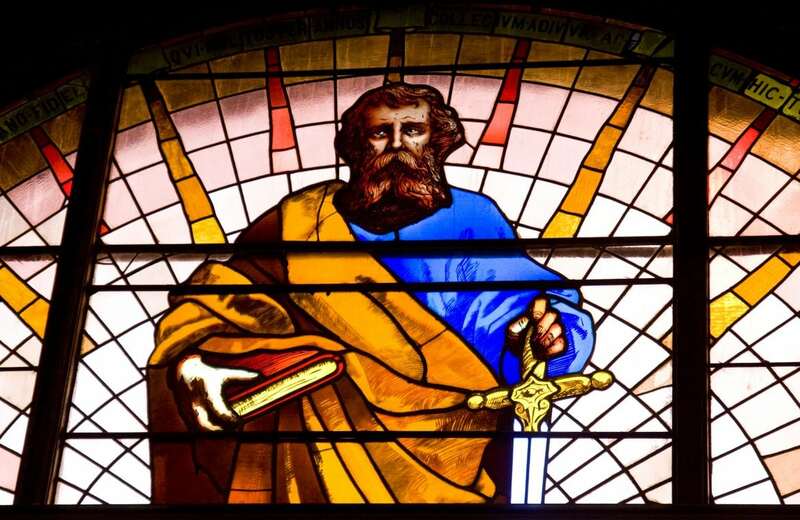 The greatest masters of stained glass moved beyond the painted and color-etched glass favored by Rinn and Juglaris. To some extent the two opalescent-type stained glass windows which appear on the east wall of the sanctuary reflect this later "high art" style. 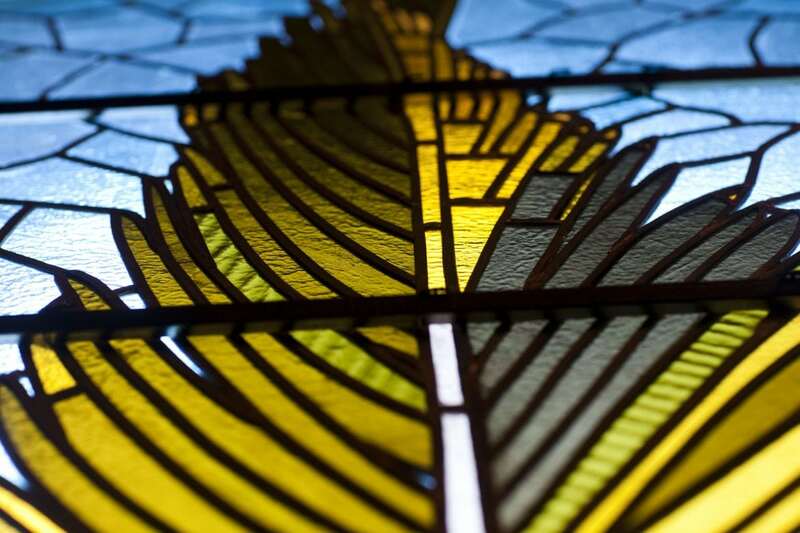 At least one of the windows, "Easter Lilies," was produced by Tiffany Studios. The careful eye will discern that some changes or modifications have been made to Goddard Chapel's exterior and interior. 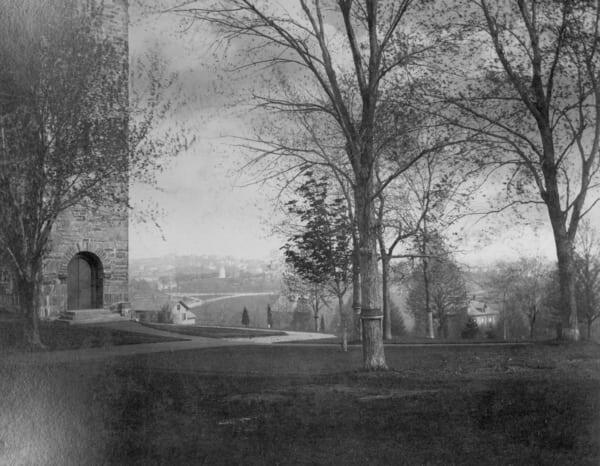 Prior to the excavation for the Wessell Library during the early 1960s, the chapel's cloister was almost at ground level. A flight of steps now connects it to a plaza below. Similarly, the interior has been slightly altered. As originally built, Goddard Chapel had two sanctuaries, the main chapel and an east transept, which were divided by folding doors. Seating in the transept was so designed that it could be shifted in place, facing west (looking into the main chapel through the opened, folding doors) or east (so that the transept became a small chapel in its own right). Unfortunately, however, Goddard Chapel was built without either lavatory or chaplaincy office space. In 1959, the absence of these facilities prompted the University Chaplain to convert the transept area into two large offices and one common room with a lavatory. 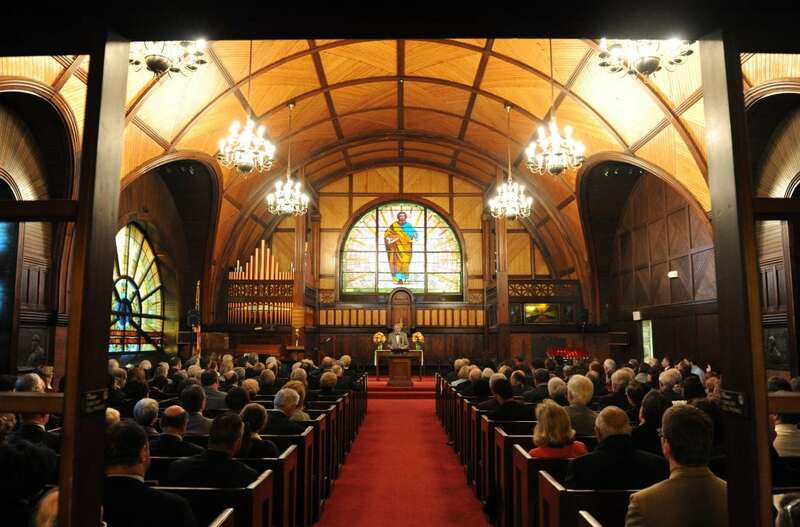 As a result, Goddard Chapel's seating capacity decreased from 490 to 340. Lighting was always a problem in the main sanctuary. 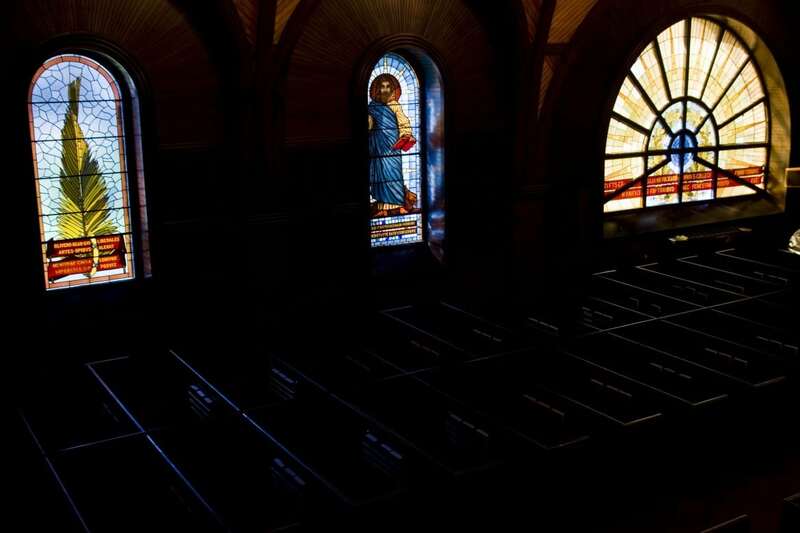 When first dedicated, the chapel was lit by gas lamps installed on the side walls. These, however, proved inadequate and were supplemented in 1889 by ceiling arc lamps, installed and maintained by Electrical Engineering students at Tufts. Incandescent lights, Halothane reflectors, and brilliant Mazda lights successively replaced the original lighting over the next decade but introduced a "disagreeable glare." Therefore, the sanctuary's electrical fixtures were changed at least twice more for either cosmetic or utilitarian reasons. The present Colonial Revival chandeliers were installed in 1949 at the request of President Leonard Carmichael. Of course, every generation has its own particular tastes. Besides converting transept into office and common space, the chapel renovations of 1959 and 1965, directed by university architect Arland Dirlam, performed a partial facelift on the main sanctuary. The ceiling, originally dyed a dark olive green in 1883, was painted in blue. Similarly, the natural spruce paneling above the chancel was painted in beige. Two large screens were added for the first time at the right and left sides of the chancel area, veiling the once-exposed pipes of the sanctuary's Hook and Hastings organ. At the same time, another set of folding doors at the rear of the main sanctuary, creating a vestibule or narthex, was replaced by a woodwork lattice. In 2002, the chapel underwent major renovations which included cleaning and replacing mortar between the slates on the exterior of the building; cleaning and releading the many stained glass windows in the chapel and offices; returning the chapel ceiling, which had been painted sky-blue, to its natural wood; removing the screens in the chancel area which covered the organ pipes (which were also restored to their original beauty); and replacing the carpeting throughout the chapel. We were also very pleased to be able to completely restore the Hook and Hastings organ. All efforts were made to preserve the historical integrity of the chapel. Goddard Chapel is surrounded by beautiful, historic greenery. John Vik, Tufts Grounds Supervisor, explains some specimens: Eastern Readbud (Cercis canadensis): Located behind the outside bulletin case at Goddard Chapel with pink flowers. Vik says, "A nice tree not quite hardy enough for this area." Chanticleer Pear (Pyrus calleryana Chanticleer): A beautiful, odorous tree that is a "tough, rugged tree for city environment." Dawn Redwood (Metasequioa glyptostroboides): Located in the grove with the cannon between Goddard Chapel and Ballou Hall. "Thought only to exist in fossil records from the Jurrasic period, an expedition to China in the late 19th century found a grove of them and specimens were brought back to America."